_The Portland Coders Socials are a regular events that—much in the spirit of Open Source Bridge—work to gather a variety of coders and those who appreciate them together to hang out, chat, and maybe even get outside. Now, it’s time for the Summer Coders Social, sponsored by Stephouse. 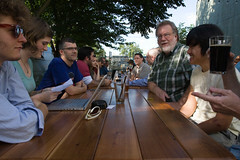 Summer Coders Social is the outdoor, sunny, sibling of Winter Coders Social (photos). The goal is a very casual, geek social event. BBQ, games, and conversation. This is a family frienldy event so be sure to bring the kids and significant other. We have plenty of space so all user groups are welcome (just be sure to sign up for the potluck). Why are we telling you? Because this time, they’ve scheduled the Summer Coders Social to fall on the Saturday after our conference, June 20. And that means you’re invited! Here’s hoping you can extend your stay and hang out with us for another day. For more information, see the Summer Coders Social wiki. To RSVP, visit the Summer Coders Social on Upcoming. This entry was written by Rick Turoczy, posted on June 4, 2009 at 3:30 pm, filed under Extracurricular and tagged coders social, portland, stephouse, summer. Bookmark the permalink. Follow any comments here with the RSS feed for this post. Both comments and trackbacks are currently closed.